Born and raised in Albuquerque, New Mexico where the sun shines 365 out of 365 days I couldn't help but see the funny sides of life. Being the daughter and niece of Taylor Cohea and GH Cohea, who bequeathed me their unique ways of viewing my fellow travelers be they animal, vegetable, or mineral I couldn't help but see the funny sides of life. Although I fought it tooth and nail with stints as a teacher, scientist, naturalist, National and State Park Ranger, cruising sailor, photographer, bank teller, etc............I was writing all the while. I sought fame and fortune in writing about ways to eliminate garden pests, nitrogen's effect on pre-commercial asparagus growth, and even waste water systems. Which, by the way, were not good for accruing fame nor fortune. I turned to health newsletters, hosted my own radio show in the Arctic wilds of Alaska. Which also weren't good for fame nor fortune. But then I started writing humor and BAMBOOM. I'd found a home..........still don't have the fame nor the fortune. But the outlook is somewhat better. So buy my book and laugh your no-your-buttocks-doesn't-look-big-in-those-pants derriere off. Remember each dollar you spend keeps me out of the local soup kitchen. Intelligent Life on Earth? 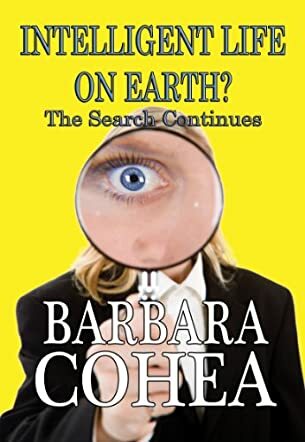 The Search Continues by Barbara Cohea is FUNNY! This entire book is a collection of short essays about… well, about almost everything. All the way through this book, I kept thinking, “This woman should be a newspaper columnist.” After the conclusion of the book, I was delighted to see that she is, indeed, a humor columnist for a magazine called Outreach NC. However, that’s not good enough. She should be a nationally syndicated columnist, appearing in newspapers all across the country. Her astute powers of observation, particularly where the absurd is concerned, should be designated a national treasure. She has a sense of humor that would make a lemon laugh. Even my wife thought she was funny, and that’s saying something. Intelligent Life on Earth shines a light on such globally significant concerns as putting a life vest on a cat, or tasing a rampaging camel. She covers in detail an incident where a swan was used as a weapon of assault, and another case where a fox shoots a hunter. And that was just in the first few pages! There are many important topics discussed in this book: milking a mouse; giving giant chocolate Madagascar hissing cockroaches to your Valentine; how to keep your baggy pants from falling off, even when the crotch is down below your knees; and the sheer stupidity of the multi-layered “security” questions you have to answer just to tell the phone company they overcharged you. Good luck with that one, by the way. I have an assignment for you, America. Buy this book; remember, it’s called Intelligent Life on Earth? The Search Continues. Read it. Then contact your local newspaper and convince the editor he/she needs to start carrying Barbara Cohea’s humor column. Let him read your copy of the book, if necessary, but I think we all need a daily dose of this kind of humor. With all due respect to her state, Barbara Cohea’s talent should not be kept solely in North Carolina.